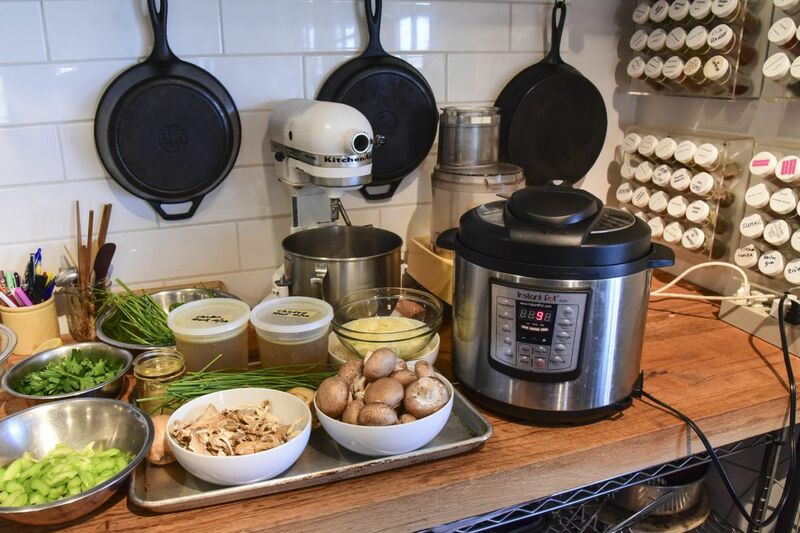 The Farm Cooking School in Titusville, NJ, is a proponent of steaming foods in new-fangled pressure-cooker machines like the Instant Pot (right). Last holiday shopping season, one kitchen gift ruled them all: the Instant Pot. The device (an electric pressure cooker that doubles as a slow cooker, rice cooker, and yogurt maker) debuted in 2010, but it took until the end of 2016 to become a best seller. Spurred on by popular food bloggers, the craze reached full frenzy over the summer, when more than 200,000 of the units were sold on Amazon's Prime Day. This autumn, many Instant Pot-themed cookbooks were published, and what recently seemed like just another passing fad started to feel like a new classic, a modern-day must-have. The Instant Pot is here to stay. Its promise to make slow-cooked foods, like braised meats, stewed beans, and hearty soups faster (if not instantly) has proved irresistible to a nation of time-strapped home cooks. For all its bells and whistles, the Instant Pot is nothing new. It's an electric pressure cooker made over with digital controls, modern safety features, and a few extra functions that go largely unused. Its most notable innovation has been taking the fear out of pressure-cooking. Ian Knauer, 40, of the Farm Cooking School, a former food editor at Gourmet magazine, works with a class at the Farm Cooking School. "People think pressure cookers will explode," says Ian Knauer, a former Gourmet magazine food editor who now runs the Farm Cooking School in Titusville, N.J. During the school's first hands-on Instant Pot workshop, Knauer reassured his students. "The only way it will explode is if you put dynamite in it," he says. One splashy recipe Knauer and his co-instructor, Shelley Wiseman, teach in their Instant Pot class is octopus salad with gigante (or large lima) beans. This dish is a good teaching tool because octopus normally requires hours of gentle braising to achieve a tender texture. In the Instant Pot, it's cooked in 30 minutes under pressure, though the time required to reach pressure brings the total time closer to an hour. Octopus white bean salad prepared in an Instant Pot. Cooking beans, especially when you start with unsoaked dried beans, can take all afternoon on the stove. The Instant Pot renders most dried beans tender in 20 to 40 minutes. Dense, slow-cooking vegetables like beets are ready in as little as three to five minutes versus the half hour or hour they would take to bake or steam. And though only the most adventurous cooks are likely to wrangle a whole octopus, most Instant Pot aficionados love the convenience of a spontaneous weeknight pot of beans. One Farm Cooking School student, Kathy Hoffman, 42, of Delaware Township, admits that though she's owned an Instant Pot for several months, she hasn't take it out of the box. That's why she signed up for the class. An hour in, her perspective on the appliance had shifted from anxiety to eagerness. "I'm going to start using it this weekend," she says after tasting the octopus salad. "My kids would actually love this." The table is set and ready for a finished meal made by a cooking class. "I use it mostly for bone broth and chicken thighs. I came to the class looking for new things to try with it," DelPlato says. Like all the students, she was excited to add a fast and easy technique for risotto to her weeknight repertoire. Risotto recipes appear in almost all of the new Instant Pot cookbooks for a reason. Cooking this classic dish under pressure frees you up to do other things as the rice becomes rich, tender, and creamy without the traditional constant stirring. You sauté a few ingredients right in the pot, add everything else at once, flip a switch, and walk away. The machine will even hold the finished risotto at a food safe temperature for up to 10 hours if you aren't ready to have dinner when it's done. Dinner in an Instant (Clarkson Potter) by Melissa Clark will walk you through her version of saffron risotto. The Essential Instant Pot Cookbook (Ten Speed Press) by Coco Morante offers risotto infused with lemon and dotted with green peas. But Daniel Shumski's aptly named How to Instant Pot (Workman Publishing Co.) is your next best bet to crack the code of Instant Pot risotto if you can't make your way to a hands-on cooking class. For risotto and an array of other dishes, Shumski provides a master method plus several variations, making it likely you'll be able to create your own versions of risotto with whatever you have on hand. This approach of pairing adaptable methods with variations and ideas makes How to Instant Pot the most useful book of the bunch. It also helps the new user decode the various functions, buttons, and programs. Best of all, Shumski reveals the Instant Pot's greatest tricks — quick ways of whipping up long-lasting, flavor-boosting flourishes that can make all the difference in your home cooking. For example, you can make a cup of buttery faux-roasted garlic paste in less than 10 minutes. Shumski provides a method for speedy, hands-off caramelized onions. His master recipe for all-purpose chicken stock leaves you with the kind of concentrated, gelatinous stock that would make a case for owning an Instant Pot even if this were the only thing the machine could do. Shelley Wiseman, 61, one half of the Farm Cooking School. For the moment, the Instant Pot brand has cornered the multi-cooker market, but other companies now make rival machines — a sure sign the thing is with us for keeps. Fans of Breville's multi-cooker claim its controls are simpler to use (though it costs roughly $250 — more than twice as much as an Instant Pot). Crock-Pot just rolled out its own version at a lower price (about $70) than the Instant Pot, whose most popular six-quart model sells for about $90, though you can frequently find it on sale for less. If you've been holding out, thinking this is a fad, it might be time to keep your eye on the internet for post-Thanksgiving sales. It isn't often that something comes along that changes the way we cook — but the Instant Pot, like the slow cooker before it, seems destined to be a cooking craze that doesn't quit.